Topcoat for an older Ekornes chair? By centerisl, April 14 in Dyes, Antiques, Stains, Glues, Waxes, Finishes and Conditioners. I asked this over in a leatherrefinishing forum and got a formula response to purchase a $215 sponsor kit. 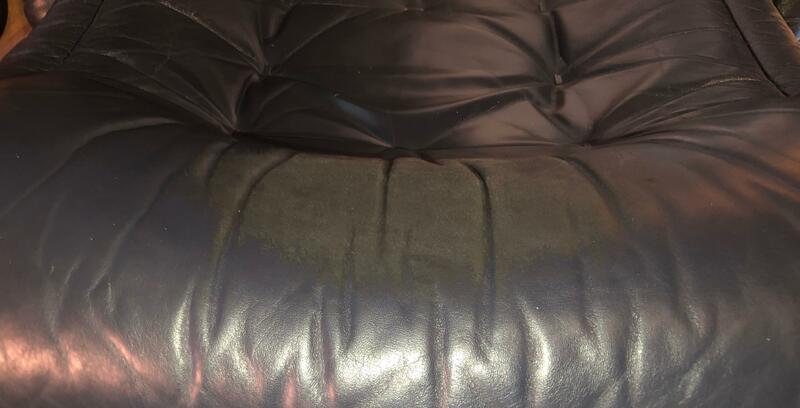 I just purchased this chair, at first thought it was soiling, seller said the finish was worn, but I think what happened is that someone wiped the headrest with a solvent. Note that the finish is intact into the folds. And I'm really lazy here - I don't want to spend more than 15 minutes "fixing" this - is there a quick coating I can put on this? I was thinking that it might simply be lacquer, and I see posts about Resolene and Leather Sheen - what would happen if I just wiped this on this spot? Go To Topic Listing Dyes, Antiques, Stains, Glues, Waxes, Finishes and Conditioners.